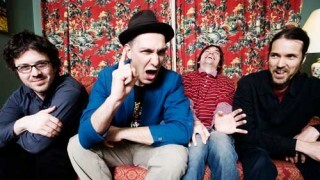 Bindiniband (L-R): Don Kerr, Dave Bidini, Paul Linklater, and Doug Friesen. That Dave Bidini — he offers up an easy metaphor by his very existence. Y’see, I was about to say something about him wearing many hats — author, columnist, rock icon — but the thing is that he actually wears a lot of hats: bowlers, fedoras, and the like. Stick a toque on him and you’ve got the ultimate signifier of his very subject matter: Canadiana. He wrote about it plenty when he was part of The Rheostatics, and continues to do so in his National Post columns, in his many books, and in song with his current outfit called Bidiniband. Their newest album, released in January, is titled In the Rock Hall. The band plays an afternoon show at Irene’s this Sunday. Ahead of the gig, Ottawa Magazine razzed Bidini via Q&A. There are plenty of familiar names joining you on tour. Who is in this Bidiniband? Don, Doug, and Paul. And Doug Pauls. Who actually doesn’t exist. Bidiniband released its second album, In the Rock Hall, in January. The title comes from a Paul Quarrington (RIP) poem. The Rheostatics’ album, Whale Music, was also inspired by Quarrington. What is it about his writing style that makes you wanna write music? I guess it’s between smart and funny, and then some. I dunno. I guess we’re just Quarrington fetishists. It’s a coin toss as to whether the floor-filler on this album is “The Best Thing About the ‘80s is You” or “Last of the Dead Wrong Things.” Can you call this one? Which one do you dance along to most? What’s the plan for the Sunday afternoon show? Can the kids come along? As in the offspring, not the hip kids. The Hip Offspring: I love that band. Actually, ya, it’s all-ages. So, you can also be very, very old and attend as well. You’re also playing a hush-hush benefit show on Saturday night. How does one bust into that show? It’s a private party. I think. Sorry, ladies. Speaking of rejection, you wrote a book about Gordon Lightfoot, but the singer-songwriter didn’t want anything to do with the process — he’s refused a number of biographers over the years. Baby, Step Back! Now that the book has been published, have you heard from him? You’ve written books about hockey, baseball, any interest in other Canadian sports: Curling? Roller Derby? Political Apathy? You’re obviously very prolific: 14 albums with the Rheos, 10 books since 1998. You must speak good English. But, and be honest here, can you understand everything Conrad Black says without using a dictionary? I only understand the grunting. And the swearing. Although why everything is like a cow udder is beyond me. You and Conrad have some shared real estate. You both have appeared in the National Post as columnists. When I searched for your name on the National Post site, it actually asked: “did you mean dave bikini?” Do you have an alter ego we should know about? Ya, why does that happen? It’s lame. Although I do have an alter-ego. Bug Dan Maldanetti. Rheos fans will know. What’s it like being with all those neo-cons on the pages of the National Post? You’re like Captain Counterpoint. Do you wear a cape? Some pals and I are trying to fashion a Bidini Song Generator and have come up with the following. Are we missing anything? On average, how often per week do you get asked about a Rheostatics’ reunion? Speaking of, what is the probability — in percentage please — of hearing a few Rheos tunes on Sunday? “Claire”? “Legal Age Life…”? “Fat” and “My First Rock Concert”! And the one about the horse. Maybe. If you bring chocolates. Bidiniband plays Irene’s Pub, 885 Bank St., on Sunday, May 27, 3 p.m. $20 at the door. Capacity: 110 or so. www.irenespub.ca/live-music. Artists and musicians coagulate at Arts Court Friday night for Capital Chill, an evening of live music, art creation, and art sales. It starts at 7:30 p.m. and tickets are $15 via this link: www.capitalchill.ca/event-information. Here is a previous culture column on Mat Dubé, one of the featured artists who will be at Capital Chill: ottawamagazine.com/culture/2011/07/08/the-writing-on-the-wall. Dreamphone keeps shoegaze music alive. The trio, led by guitarist/vocalist Jordanna Marchard (ex of Les Allumettes), releases its new EP, Feeling Magenta, Friday night at Café Dekcuf, 221 Rideau St., second level. We Fled Cairo and Heavy Bedroom open. 8 p.m. ,$7.